There are a bunch of buyers out there who love a car that is blacked out. Black paint, black wheels, black interior is a popular combination on many cars out there. 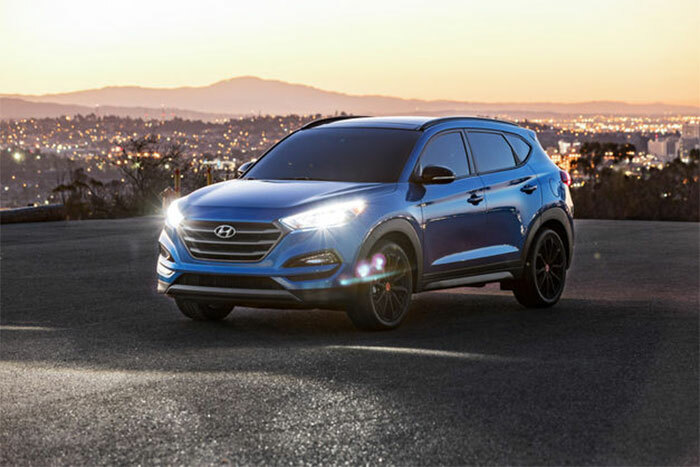 At SEMA 2016 Hyundai rolled out its new Night model of the Tucson CUV. As you expect, the car is black and has exclusive black Rays wheels. In the dark images here the Night model looks a bit blue, and it could well be. There are only a few colors available including Coliseum Gray, Caribbean Blue, Dazzling White and Black Noir Pearl. The Night model is based on the Tucson Sport adding the black wheels, panoramic sunroof with black-tinted glass, and gloss black side mirror caps. Inside the car it has aluminum sport pedals, perforated leather steering wheel, and front and rear LED map lights. Pricing will be announced with dealership availability in the coming weeks. The Night model will go on sale in late 2016.